← Full-Frame Warbler Action on the Boardwalk! I guess I do dare, because that’s what I’m getting ready to do. In order to go through with this public display of my first sketching attempts, I’m repeating over and over in my head, “Silence your inner critic!” in the gentle voice of Kelly Riccetti. Kelly is the very patient and talented artist who taught me (and some other eager nature lovers) for a few hours on a rainy May day in northern Ohio during the Biggest Week in American Birding. We’d signed up for a course on field sketching and nature journaling and we got far more than we expected. As preparation for this course Kelly wrote and self-published an entire book, and gave it to us as part of our course materials. She also gave us some drawing supplies and folding camp stools that we used in our class. We started our day at Pearson Metropark by setting up our little outdoor studio on the shore of a small pond. The first thing we drew was a landsc ape, to teach us about how to frame a view and dissect it into foreground, middle ground, and background. The view was lovely but I was very nervous, especially knowing that someone would be watching over my shoulder as I limped my way through a new skill. (That’s one of the stumbling blocks for HSPs, by the way. Even when we’re very good students, we often perform worse when we’re being observed.) But with her gentle encouragement and praise at our efforts, we all managed to get past that first assignment. And we had lots of fun doing it too. It was so funny because many of us were getting distracted by a singing Eastern Phoebe in the woods…this was the only time at the festival that we didn’t have our binoculars with us, and it felt very strange. Next we moved to another location in the park and began learning to draw flowers. Our workbooks had lots of sample drawings and tips to help us, and we all dove right in this time. Here are my first two flowers, with my attempts at shading to give them dimension. I really enjoyed this part. After a lunch break we moved on to drawing birds. 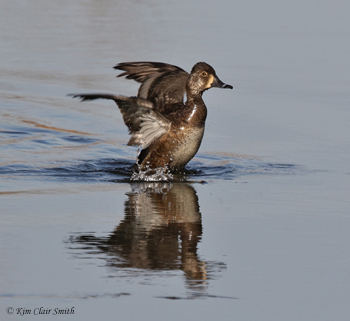 I had a feeling many of us had been waiting for this part — after all, we were at a birding festival and were all bird lovers! But birds are harder than flowers, that’s for sure. Kelly explained ways to draw two-second bird sketches as a way to warm up and train ourselves to begin to really see the birds. But after that we practiced on bird photos, learning to show different postures and how to place the eyes, beaks, and other parts properly. I was fascinated at how useful some of the drawing tools were too. The kneaded eraser is so much better than any other eraser I’ve ever used! And the little blending sticks (tortillons) make all the difference in the world in a sketch. I’m so glad she taught us to use those things! Move over Charley Harper….haha, just kidding! This is an unfinished sketch of a Northern Cardinal. I was attempting to copy one of Kelly’s drawings from her book, but when she saw what I was doing she said my style reminded her of Charley Harper’s work. I didn’t even know I had a style already, but you can put me in the same sentence with Mr. Harper any time! I’ve been home for about ten days now and hadn’t had time to practice until today. Kelly mentioned that she was going to revise her book (this is a first draft) and add a chapter on frogs, turtles, and snakes. I remembered that I’d shot a good photo of a garter snake a couple years ago on the beach at Tawas Point State Park (during another birding festival, of course), and I decided to see if I could sketch that photo. And I did! I know there are some problems with this sketch, but it’s my first attempt and it only took me about 45 minutes, so I’m pretty much in love with it. By the way, since I have this birder’s compulsion to put a name on everything I see, I believe this is a Butler’s Garter Snake (Thamnophis butleri). There, that feels better. 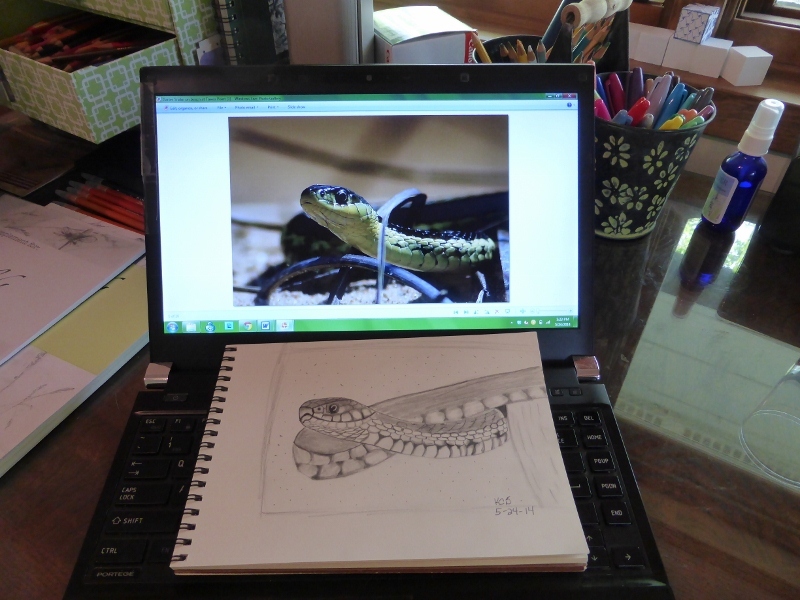 Garter snake sketched from my photo. My next step is to do some sketching from the real world instead of from photos. I’ll probably do more flowers or other things that don’t move as fast as birds, at least for now. But I’m pretty sure there will be some more bird sketches in my future too. How can I resist? I can vouch for that part already. And I don’t know about you, but I don’t think it’s ever too late to learn a new skill. Admittedly it’s harder to be “not good” at something as an adult student, but a great teacher can even make that part easier. Just remember to put a muzzle on your inner critic and go full steam ahead. You never know where you might end up, and that makes life exciting and fresh! 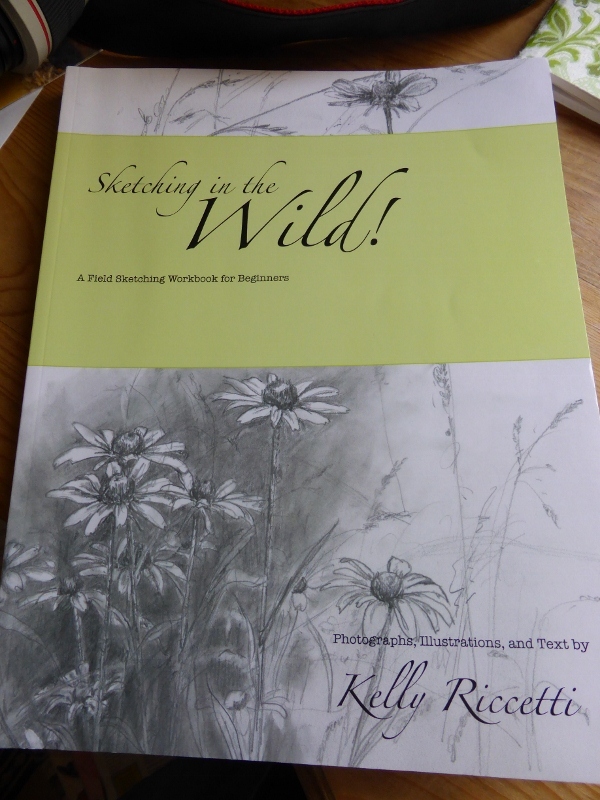 This entry was posted in BWIAB, Creativity and Nature and tagged drawing, drawing birds, drawing flowers, field journal, nature journal, sketching. Bookmark the permalink. 14 Responses to Dare I Show You My Nature Drawings? Kim, these sketches are beautiful! Dom (the art student that stays with us) is always trying to get me to draw when we’re out observing nature. I can’t draw anything but stick people and even those are awful looking! Keep showing us your work. It’s inspiring! These are beautiful. You definitely have very strong talent. I hope you keep it up with the drawing! Kim it sounded like the perfect getaway to me your drawings are fabulous and I am glad you shared them with us. I dream of going on a weekend like that. First of all, I want to say how brave you are to show your drawings. I don’t think I would have that much courage. Secondly, your sketches are terrific! I mean it. At the start of your post, before I saw your work, I was expecting to see some pictures that were one grade above stick figures. These pictures are actually real pictures! I’m very impressed. Do you now if she has extra copies of her book she is willing to sell? Please do let me know Kim! Although I would probably be happier with the non-snake version. Ha! I love your sketches, Kim! The flowers are especially nice, and your Cardinal is quite charming. I hope you keep pursuing this new dimension of your enjoyment of nature. I think your pictures are great. I knew I should have signed up for that class. I hope she does it next year. I’m pretty sure she IS going to teach it next year, Kim! Thanks, Denise, I intend to! Oh thank you! I’m so nervous about what people are going to think of my beginner drawings!